Autoship Systems Corporation (ASC) provides leading-edge CAD/CAM software for vessel design and construction, on-board strength and stability monitoring and customized load and stowage planning. ASCs On-board and Load Planning software, Autoload is used at all stages of vessel operations. The program reads data from tank, draft, wind and SCR sensors as well as user-input, and then reports on the condition of the vessel. Autoload is often used in conjunction with ASC-developed load planning modules specific to a vessel type, eg. supply, jack-up, bulk, ro-ro, rig, etc. Ashore, the load planning modules are interfaced with the in-house booking systems and are used to create load plans which are then transmitted back to the vessel thus allowing more optimal loading in shorter time. Web Site Snapshot: If available, above is a snapshot of the Autoship web site at http://www.autoship.com/ as it appeared when this site was added to the directory or last verified. Please Note that Boat Design Net has no involvement with the above web site; all content and images depicted in the above thumbnail are the property and copyright of Autoship unless otherwise noted on that site. 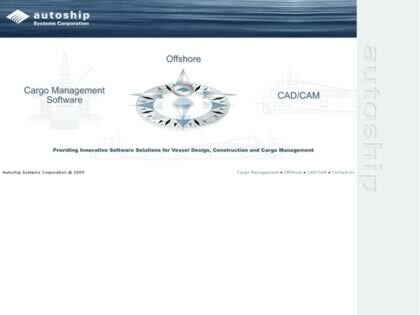 Description: Autoship Systems Corporation (ASC) provides leading-edge CAD/CAM software for vessel design and construction, on-board strength and stability monitoring and customized load and stowage planning. ASCs On-board and Load Planning software, Autoload is used at all stages of vessel operations. The program reads data from tank, draft, wind and SCR sensors as well as user-input, and then reports on the condition of the vessel. Autoload is often used in conjunction with ASC-developed load planning modules specific to a vessel type, eg. supply, jack-up, bulk, ro-ro, rig, etc. Ashore, the load planning modules are interfaced with the in-house booking systems and are used to create load plans which are then transmitted back to the vessel thus allowing more optimal loading in shorter time.